We are delighted to welcome you to our home. LagoonAndSea is our fully equipped self-catering chalet, situated in the MeerenSee section of the private Middlevlei Estate, near the mouth of the Bot River lagoon in the well-known and ever-popular Hermanus district. We strive to facilitate a pleasurable and outstanding holiday experience, providing all the necessary comforts and conveniences of a cosy family home while also offering a most unique location with breathtaking beauty and tranquil surroundings. The private Middlevlei Estate is situated within an exquisite nature conservancy surrounding the Bot River Lagoon and the world famous Kogelberg Biosphere Reserve. 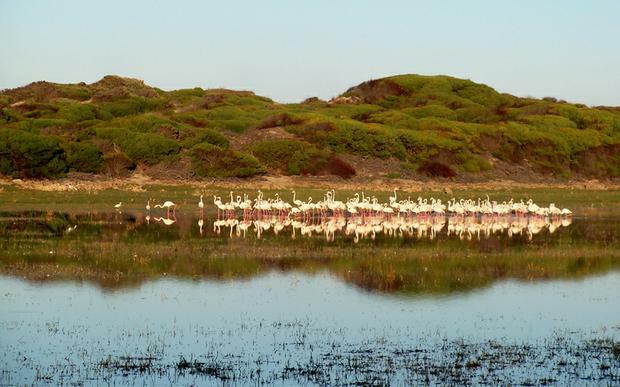 It is registered as an international RAMSAR site for the protection of wetland habitats and water birds, such as flamingoes, pelicans and spoonbills. A number of breeding pairs of the endangered African Black Oyster Catcher are often seen on the beach and close to the mouth of the lagoon. International registration in 1998 means this area forms part of a world wide network of biosphere reserves. The Estate is private and secure, with great children’s facilities, large swimming pool and toddlers’ pool, two full tennis courts, a recreation hall with DSTV, pool table, table tennis, games, bar and tuck shop, and bicycle roads inside the estate. The chalet is situated at the end of a cul-de-sac and very safe for children. There is a slip for lagoon boating and fishing. Pelicans, flamingoes and a variety of birds are seen all around the lagoon. Approximately 18-22 wild horses live freely in the dunes and have done so for possibly the last century. 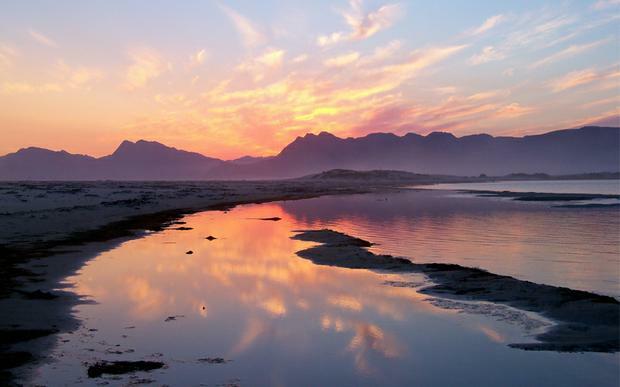 You can walk along the unspoilt, clean sandy beach for a few hours until you reach Kleinmond. The entire lagoon and estuary experience is great for many nature lovers. The wild horses, birds, whales, dolphins and some small wild buck and cats can be seen by the patient visitor from time to time. The chalet is located about 70 to 120 meters from the lagoon water’s edge (depending on the water level) at the pedestrian wooden bridge of the Botriver Lagoon mouth. This bridge enables you to walk from the house and lagoon directly onto the beautiful and spotless, long sandy beach. The lagoon estuary is a bird sanctuary in a Nature Conservancy and therefore pets are not allowed. There is on site whale watching (June - November) from the lagoon mouth, walks along the water’s edge all the way to Kleinmond, and a good likelihood of seeing wild horses. Canoeing, fishing, water skiing, sailing, and swimming are popular in demarcated areas of this lagoon. Recreational hiking and cycling opportunities abound under the many Milkwood and other trees on avenues in and around the estate which hugs the lagoon edge for approximately a kilometer and beyond on various scenic routes. At a fee, water-skiing or wake boarding tuition, as well as boating or tubing on our Scimitar speed boat is available on the lagoon, only by arrangement well in advance, with written confirmation. LagoonAndSea offers family holiday accommodation of a superb standard within beautiful and tranquil surroundings. Hermanus, Gansbaai, Kleinmond and Onrus are all close enough to explore and enjoy from your ‘base camp’, yet far enough away that its busyness do not cause disturbance to your peace and privacy. We are confident that you will thoroughly enjoy your stay over. 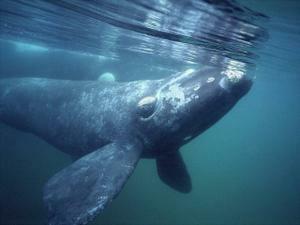 We look forward to welcoming you to our very special spot on the beautiful Cape Whale Coast. Contact Us about fantastic Mid-week and Low Season specials! Rates from R800 per night.